Hello all! Please join us for our School Site Council Meeting this Tuesday at 3:30pm in the library! Join Us For our SSC Meeting Tuesday 3/20/18 In the Library At 3:30 pm! 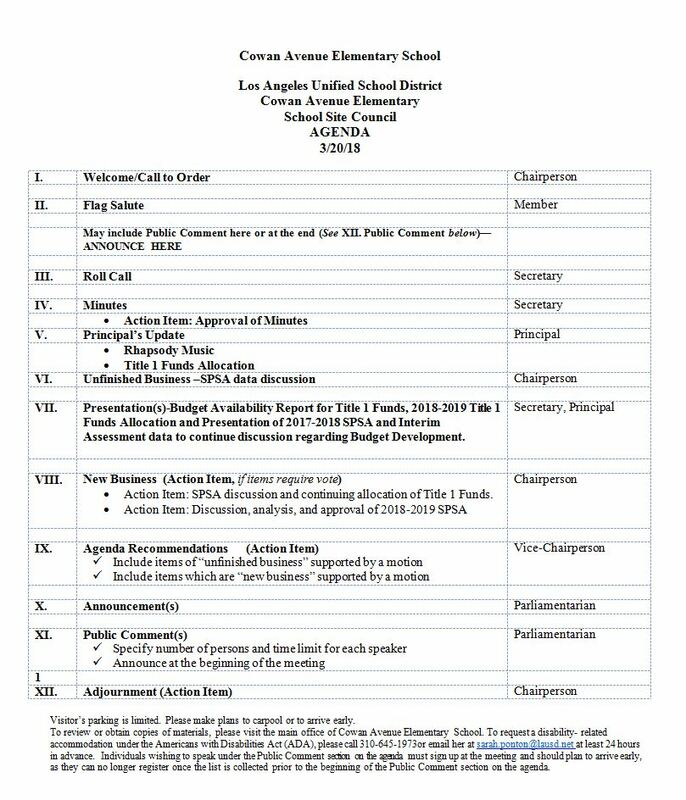 This coming Tuesday we will hold our SSC meeting to review and discuss the 2018-2019 Title 1 funds allocation and SPSA as well as continuing 2017-2018 budget adjustments. Come join us Friday, February 23rd, as Cowan Students proudly present their annual Black History Month Performance. The first show will begin at 8:30 and the encore performance will begin at 10:45. School Site Council Meeting Tuesday 2/13 at 3:30 pm in the library! Join us as we begin reviewing SPSA data and Title 1 funding during our School Site Council meeting this Tuesday 2/13 at 3:30pm in the school library. Join Us for the Run for Education on March 10th at LMU! Join us for the Rock Roll and Run for educaion at Loyola Marymount University on March 10th! This is an amazing opportunity to raise funds for our school! For the first 20 registrants 50% of proceeds go directly to Cowan and for every registrant after 20, 100% of proceeds go to our school! Cowan is one of the top schools in the Westchester/Playa community and we need your support to continue building opportunities for our students! Let's show up in force and join team Cowan now! School Site Council Meeting on Tuesday 1/16/18 at 3:30pm! Our first School Site Council Meeting of 2018 will be hosted in the library at 3:30pm and will discuss Title 1 Funds Distribution, Assessment Measures for goal setting, and upcoming Parent Workshops! Mail Alert! Mailed Today 11/29/17 is the Parent-School Compact, Parent and Family Engagement Policy, and the LAUSD Title 1 Policy! The Cowan Avenue School-Parent-Staff compact highlights how parents and the school can work together to increase student achievement together! The Parent and Family Engagement Policy highlights how Cowan involves parents, builds capacity, and shares responsibility for high academic achievement. Additionally, the LAUSD Title 1 Policy is included to share with parents how the District is working with parents to build a stronger partnership in education. School Site Council Meeting this Thursday 11-14-17 at 3:30pm! All are welcome to attend as we discuss Title 1 Funds and the Student/Parent Compact and the Parent and Family Engagement Policy. Click on the link to read Mr. DaSylveria's letter on parent conference week with information about scheduling your appointment, report cards, and next weeks dismissal schedule.